When I say the words “Captain Morgan” I would be willing to bet that nearly anyone would know what I’m talking about. It’s ubiquitous and duly so. Captain Morgan Spiced Rum is an approachable rum for nearly anyone, mixes well with Coke and has a solid vanilla flavor that works well in that application. No surprise that, when Captain Morgan Black Spiced Rum came through the door, I was intrigued. Dark rums, by default, tend to have a stronger molasses flavor and thus a steeper learning curve, for lack of a better analogy. Black didn’t follow suit as I had expected. It has a strong vanilla aroma with some other hints of spice coming through, but only barely. The flavor is sweeter than I had expected with the vanilla again being the star. There are tones of brown sugar and molasses but gentler than other dark rums I’ve had. The other spice notes are there, but not strong. Captain Morgan Black is aged in double charred barrels which, I can imagine, is where the strong tones of vanilla come from. But this aging brings with it other tones that are more familiar to aged whiskies like caramel and butterscotch. The thing I find most intriguing is that the sweetness of the rum totally masks the fact that it’s bottled at 47.3% ABV. While the flavor is gentle it’s a bit like getting hit with a pillow full of bricks. Gentle on the outside, but still capable of knocking you down. While I certainly can’t recommend that you mix this rum in a Dark and Stormy, given that that name is a copyright of the Gosling’s brand, I could recommend something similar. Perhaps a Dim and Thundery. I’m sure you can work out the details. It’s no secret that I’m a huge hard cider fan. My friend and college roommate Ted first introduced it to me and to this day calls it “the gateway beer”. While I didn’t agree at the time (see my early post on beer) I’m starting to come around to the idea now. But, no matter my take on beer at the time, I was hooked on cider from the start. In the last few years we’ve seen the cider market in the US grow like kudzu and Angry Orchard is one of the newer kids on the block. They certainly know their cider though. 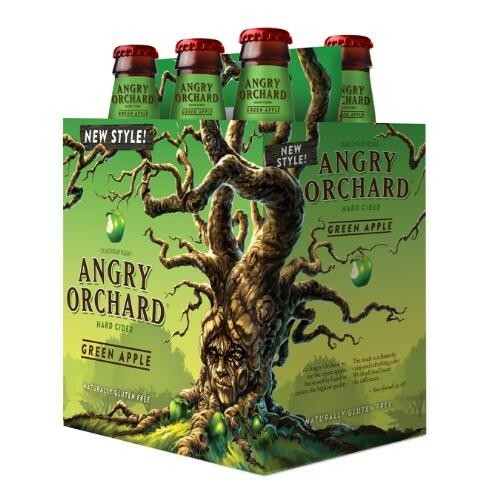 Most of their ciders tend to be on the sweet, but not cloying, side and their newest flavor, green apple, follows suit. It has a bright, crisp flavor with the distinct tannic notes you get from the peel of a green apple. In addition to the tannin there is the unmistakeable flavor of tart green apples. The finish is quick and light and there is no aftertaste. Overall this is a great summer cider and I could see myself drinking quite a few. Knowing that the only ingredients are their blend of apples and yeast makes it all the better.